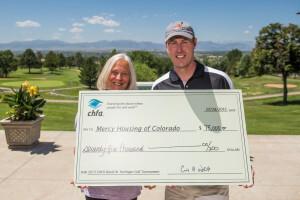 (DENVER) – ​​​Colorado Housing and Finance Authority’s (CHFA) David W. Herlinger Golf Tournament raised $75,000 for Mercy Housing Colorado on Tuesday, July 28, 2015. Funds will support Mercy Housing Colorado in their efforts to provide affordable, program-enriched housing to more than 2,000 low to moderate income Coloradans including families, seniors, veterans, and people with special needs. Approximately 80 golfers and 19 corporate sponsors participated in this year’s event. This is the 12th year CHFA has held a golf tournament with proceeds benefiting a local nonprofit whose work coincides with CHFA’s mission of affordable housing and economic development. The 2015 tournament was held at The Ranch Country Club in Westminster, Colorado. The event is named in memory of CHFA’s former Executive Director David W. Herlinger, who passed away in 2012. It serves as a reminder of his passion for the game of golf, and for helping local nonprofit organizations whose work supports affordable housing in Colorado.